Known as Eugene, he had been a student at Genesee College when he enlisted as a Private in the Cleveland (OH) Light Artillery on 19 April 1861. By the end of his 90 day term of service he had been promoted 2nd Lieutenant. He then returned to New York intending to resume his studies. However, along with brothers George and Stephen he recruited a company of troops (later Company D, 102nd Infantry). He gave his age as 22 years when he enrolled, 15 October 1861, at Lima, NY to serve three years; mustered in as Captain, Company D, 102nd New York Infantry on 15 February 1862. During 1862 he served as acting Major of his Regiment, and as Brigade Quartermaster (Colonel Van Buren, 102nd NY, commanding). ... [about 6:30 am] while the line was forming, under fire of sharpshooters of the enemy, Captain M. Eugene Cornell, of Company D of this regiment, fell, dead, at the front of his command while bringing them into line, being shot through the head. Basic information from State of New York1. Thanks to Steve Maczuga for publishing the NY regimental information in his excellent database. Further details from his obituary in the Ontario Republican Times, Canandaigua, NY of Wednesday 15 October 1862, Pg. 3 (transcribed online by Dianne Thomas). 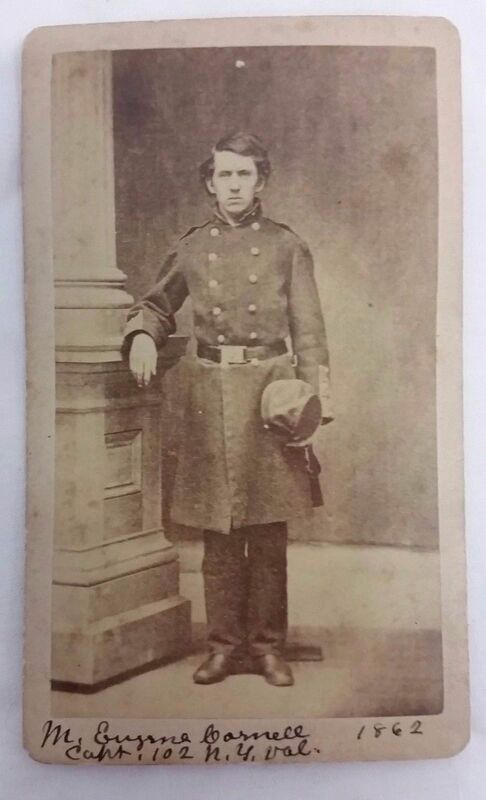 The photograph here is from a larger CDV kindly provided by Bill Howard, who notes that it may have been taken earlier in the War when Cornell was a Lieutenant in the Cleveland Light Artillery. Russell Kasper has also posted a tinted tintype of the Captain on a page for him on Findagrave.